Located right next door in Sharon, the corn maze at Ellsworth Hill Orchard & Berry Farm is the closest to us here at Interlaken. Keep your eyes on the prize — you’ll still catch glimpses of those legendary Litchfield Hills at some angles while you’re searching for the right turn. After you’ve mastered the maze, keep the family fun chuggin’ along on a hayride tour of the enormous pick-your-own apple orchard and berry farm, and head back to the farmhouse for a celebratory snack of cider donuts and fresh-pressed cider from the mill. Bunnell Farm over in Litchfield touts a tricky, custom-made corn maze fit for all ages. Each October, Bunnell embraces the spooky spirit by inviting you to stop by after sundown and find your way out of a flashlight maze. You won’t see anything seriously scary beyond the dark of the night, so it’s suitable for even the youngest maze-solvers. Head to the farm on the weekend and you’ll also get to hop on a free hayride to a pick-your-own pumpkin patch. Alright, so we’re bending the rules a bit... but Kesicke Farm, just across the New York border in Rhinebeck, deserves a spot right next to our favorite Connecticut corn mazes. If you’re thinking of taking any tots to the Litchfield Hills, Kesicke is for you. Kids who aren’t quite big enough to meet the challenge of a corn maze can take a wagon ride through the passageways. It’s also the only farm around to feature a barn full of lively farm animals, so it’s well worth a trip across the New York/Connecticut border to add some goat-feeding and pig-petting to your itinerary. It’s a little further afield, but Hayes Corn Maze over in North Granby is well worth the detour if you’re on the hunt for a larger labyrinth. Tackle the maze in one of two ways: a standard puzzle of running from point A to point B, or by taking on the “Maze Master” Challenge, where teams seek out six stations hidden within the maze, each with its own puzzle to solve. Don’t expect a cookie-cutter maze, either — each year, the maze-makers push the creative bar higher by carving a distinct design into their fields. In 2017, their maze resembled a slice of Domino’s Pizza. ?Racing through corn-husk havens is a sure-fire way to get your fix of family fun, but there are far more fall attractions waiting in the Litchfield Hills. 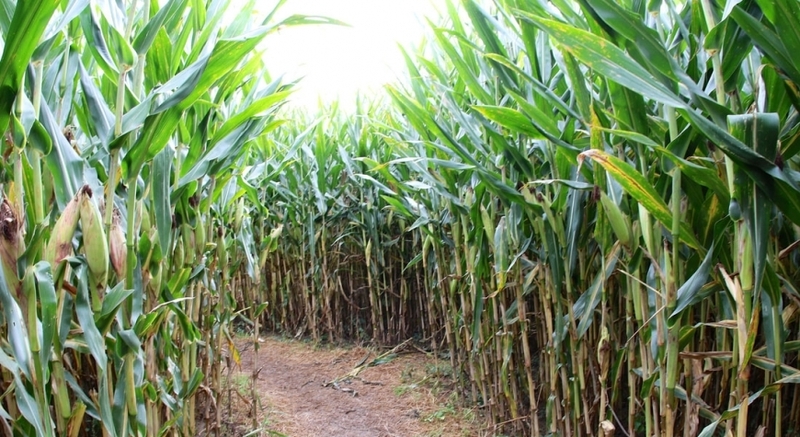 Solve all of these northwestern Connecticut corn mazes and dive into more countryside attractions during a stay here at Interlaken Inn — we’re easier to find than the other end of a corn maze, promise. When the crisp autumn air starts to blow, we bust out more than just the cozy sweaters in the Litchfield Hills. A talented team of chefs, led by Executive Chef John Welch, modify the menu at our Morgan’s Restaurant to feature the fresh flavors of fall.